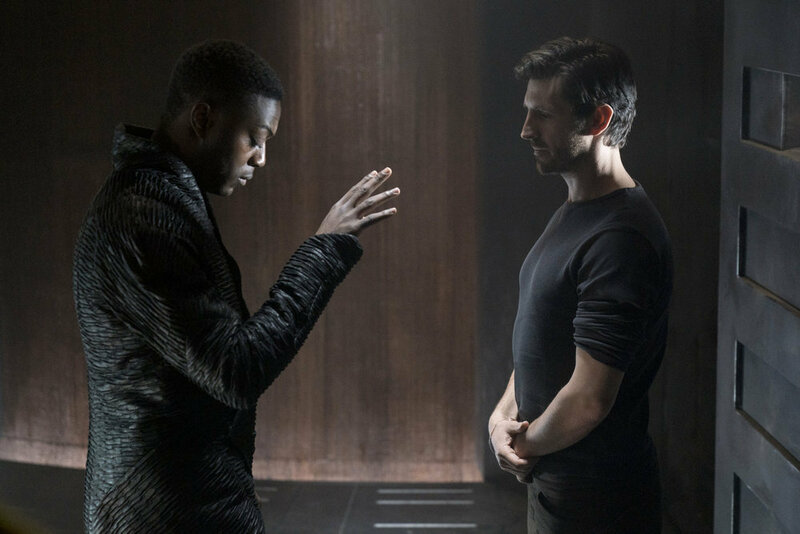 Nightflyers was developed for TV by Jeff Buhler (The Midnight Meat Train; Pet Sematary (2019)), who is also acting as showrunner, and stars Eoin Macken (The Night Shift), David Ajala (Supergirl; Falling Water), Gretchen Mol (Yellowstone; Boardwalk Empire), Sam Strike (Mindhunter; EastEnders), Jodie Turner-Smith (The Last Ship), Maya Eshet (Teen Wolf), Angus Sampson (Shut Eye; Fargo) and Bryan O’Bryne (The Magicians; Aquarius). Nightflyers is produced by Universal Cable Productions and co-produced by Netflix (which has airing rights outside of the US). Interestingly, Martin is credited with an executive producer role though has had no active role in the creation of this series (his Game of Thrones deal with HBO has an exclusivity clause in it which prevents him from working on shows adapted from his work that doesn’t air on HBO). Martin’s novella was published in 1980 with an expanded version published a year later. It’s appeared in several collections over the years. In 1987, a movie was made based on the novella but Martin, while acknowledging the movie probably saved his career, complained about having to cut plot points to fit budget (and, presumably, time constraints). There is no such issue here. Nightflyers is set in the year 2093. Earth is slowly dying from widespread disease and depletion of resources. Professor Karl D’Branin (Macken) has a theory that an object passing near-ish to our solar system is a ship manned by the mysterious alien race, the Volcryn. He wants to launch a manned mission to deep space to intercept these Volcryn and hopefully gain some insight on their technology which maybe will be able to save humanity. Some background that’s implied: Humans have achieved a decent level of space travel by 2093 but hasn’t yet voyaged too deep into the “Abyss” (or the “void” which is a term also used). Also, humans are now living on other planets and/or moons in our solar system. Last, this is a world where aliens are considered to be concrete fact but, it appears, no humans have actually made any first contact as of yet. When the academic community puts down D’Branin’s alien meet and greet plan as quack quackiness, the mysterious Roy Eris (Ajala) reaches out to D’Branin and offers him the use of his deep space-capable colony ship, the Nightflyer. D’Branin jumps at the chance to lead this mission and breaks the news to his wife, Joy, and daughter, Skye (Bronte Carmichael), that he will be leaving them for two years. Using the advanced “memory replay” system on the ship, D’Branin spends a lot time of remembering his family on Earth. Almost immediately, the crew and passengers of the Nightflyer begin to experience accidents and violence aboard the ship. Someone (or something?) seems determined to keep them from fulfilling their mission. The human condition is on full display as people blame each other, point fingers, turn on each other and grow violent. Grow murderous, even. Is it the unstable telepath sabotaging them? Is it aliens? Or some malevolent spirit acting out against them, a ghost in the machine as it were? Distrust is rampant aboard the Nightflyer, even as people find comfort with each other (it’s called “sexing” in the future) while others find camaraderie and yet others, spend their time acting as major creepers. There is a famous trope that in space, no one can hear you scream but in the relatively small, cramped confines of the Nightflyer, things are destined to work out very poorly and you will definitely hear someone scream. Several someones. Dr. Agatha Matheson (Mol). A psychologist with a specialty in working with telepaths (called L1’s), Matheson is on board Nightflyer to act as the intermediary for Thale. She is his confidant and has been his doctor since he was young. She has some history with D’Branin. Thale (Strike). An L1 (telepath), Thale is very young and very brash. Seems in 2093, telepaths are feared because of their immense telepathic power; indeed, Thale can not only see into people’s thoughts but he can manifest people’s greatest fears and maybe has some level of mind control. He feels (seems simultaneously) everyone’s emotions on board. He is mercurial and requires frequent intervention from his counselor, Dr. Matheson, to help remind him to control his emotions. He is on board the Nightflyer because D’Branin feels he is the best hope to be able to communicate with the alien race, the Volcryn. The crew fears him, almost across the board, and he is blamed for every bad thing that happens on the ship. Melantha Jhirl (Turner-Smith). Mel has been born and bred for space travel. While human, I think it’s safe to say she is an enhanced human. She can withstand higher levels of radiation, longer times of oxygen deprivation, in short, the extreme stresses that space travel may place upon the human body. She’s a smitten kitten with Lommie but also, is an object of attention from the mysterious captain, Eris. Lommie (Eshet). Lommie is a human that has been enhanced with all sorts of imports and plugs that allows her to communicate with machines and the Nightflyer itself. She has a troubled past that we learn a little about and is not very experienced with intimate and sexual relationships. Socially awkward, she finds a fast friend in Jhirl. Rowan (Sampson). The resident xenobiologist on board the Nightflyer, Rowan is pretty sure they are all going to die out in space in pursuit of D’Branin’s aliens. But, hey, better to go along for the ride than not. He reminds me of Dr. Ian Malcolm from Jurassic Park. He is a source of comic relief on the ship (a rarity – these are not funny people). D’Branin and Rowan have an established friendship pre-dating the mission and he acts as a sounding board for D’Branin. Roy Eris (Ajala). A mysterious figure, not only the captain of the Nightflyer but also heir to a legendary company, Eris Corp, which found space travel fame under the leadership of his deceased mother, Cynthia Eris. Among his quirks, Eris never appears in person. He communicates with his crew and with his guests via holographic image of himself. Also, he uses a sophisticated camera system on board the Nightflyer. Eris is always watching all areas of the ship (and, all people on the ship). Auggie (O’Byrne). Almost as mysterious as his captain, Auggie is Captain Eris’s right hand man. He is the main day to day manager of ship activity and acts as a conduit of interaction between Eris and the rest of the crew. He is extremely loyal to his captain and seems to have been with the Nightflyer since the days when Roy’s mother ran the ship. LOVE IT OR LEAVE IT? LOVE THIS SHOW! Nightflyers excels as a dramatic series because of its interesting writing and excellent acting. With appropriate screen time each episode, your core cast gets much better character development than you’d expect to receive in such a large ensemble show. After five episodes, I feel like I know enough on each of the core members of the series as to be able root for, or against, them in an informed way. This is the kind of show that makes me stop playing games on my phone and watch what’s happening on the television screen intently. 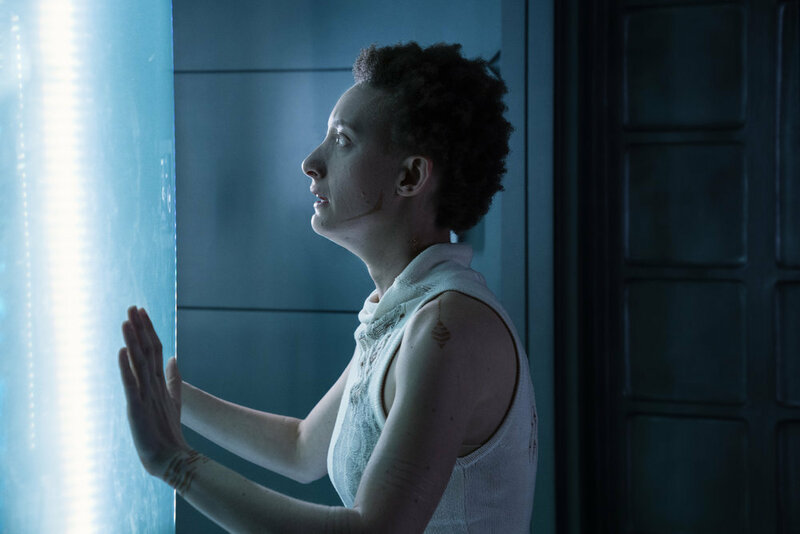 As a genre show, Syfy has put a significant amount of money into the production value of Nightflyers. The result is a sci-fi show that makes you feel like you are really in the bowels of a futuristically bleak spaceship. The Nightflyer is robust in size and scope and feels like an actual setting. To say nothing of the fact that the ship itself is a full fledged character on the show. As sci-fi horror and psychological thriller, Nightflyers will grip you within 30 seconds of the opening scene and fill you with dread. And it, Never.Lets.Go. Even when nothing particularly sinister is happening on screen, you never feel relaxed, you always feel like horror and/or violence is just around the corner. It takes the best elements of classic horror movies and sci fi horror and rolls it out in spades, across each hour of the show. Think the insanity of The Shining and Psycho, the fright of the unknown enemy from Alien, the human fear of machines represented by HAL in 2001: A Space Odyssey. 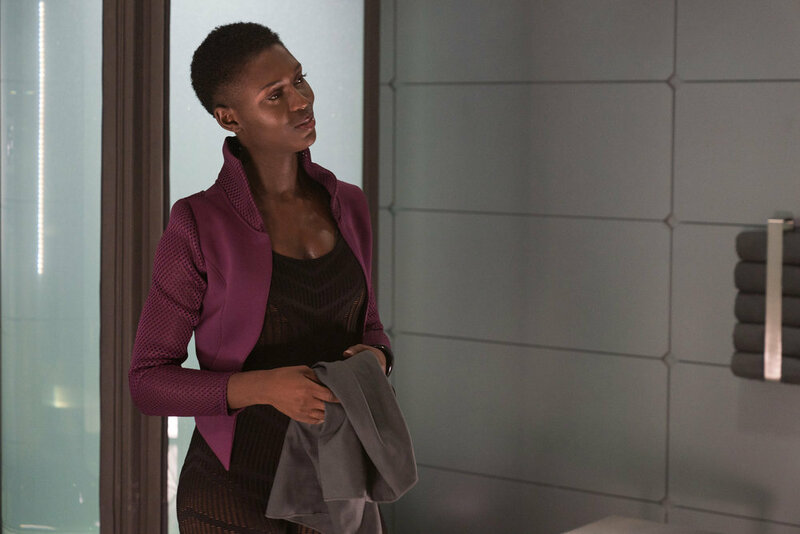 Nightflyers checks all the boxes of great television. While not for everyone because of the subject matter and violence (implied and real), if you enjoy sci-fi, you owe it to yourself to watch this show.